يشكل Royal Palms Motor Inn بموقعه الممتاز في كوفس هاربر نقطة انطلاق جيدة لاستكشاف هذه المدينة النابضة بالحياة. يسهل الوصول إلى هذا الفندق ذو 3.5 نجوم من المطار، فهو يبعد عنه مسافة 4. Km فقط. بالنسبة لمن يريد الخروج، هذه بعض المعالم السياحية المتوفرة للزوار Wicked Berries, Park Beach Plaza, ‪Coffs Creek Walk and Cycleway‬. يقدم Royal Palms Motor Inn خدمات لا غبار عليها وكل أشكال اللياقة وحسن الضيافة اللازمة لإسعاد ضيوفه. يقدم الفندق فرصة للاستمتاع بشريحة واسعة من الخدمات بما فيها: واي فاي مجاني في جميع الغرف, خدمة التنظيف يوميًا, مرافق مخصصة لذوي الاحتياجات الخاصة, صف السيارات, مرافق للشواء . بالإضافة لهذا,تتضمن كل غرف الضيوف مجموعة واسعة من وسائل الراحة . بعض الغرف توفر حتى تلفزيون بشاشة مسطحة, اتصال لاسلكي بالإنترنت, غرف لغير المدخنين, مكيف هواء, تدفئة لإرضاء أكثر الضيوف تطلباً. يقدم الفندق خدمات رائعة كمثل حمام سباحة خارجي لمساعدتك على الاسترخاء بعد نهار طويل من النشاط والتجوال في المدينة. إن Royal Palms Motor Inn هو خيارك لخدمة الفنادق الراقية في كوفس هاربر. Thank you for your lovely feedback Renay. We look forward to seeing you next time! This room we were in was a basic one room with bathroom. It was exceptionally clean, the bed, linen were excellent. The pool was lovely, and the location was amazing, we just walked to the beach, hoey moey for dinner, and other cafes. We could also walk to Park Beach shopping centre and there was a small group of shops including a small supermarket next door. Highly recommend this motel. we took a road trip from GC to Sydney. we stay 1 night. this place is clean and nice place. note: check in from 10am until 8pm. so better hurry because after 8pm then its close. overall its a great place to stay. Great value for money! Our group of 4 booked last minute and checked in the next day, but the staff was extremely accommodating and made us feel very welcomed. Great/fast communication, and very convenient location - very close to shppping centre and local shops. You definitely won't regret staying here! Stopped here in my way south, just for the night. And I'm sad about missing the beautiful town of Coffs Harbour! The hotel is very nice, with all you can need. The staff is so kind and helpful that I'll repeat without hesitate if I'm back in town. 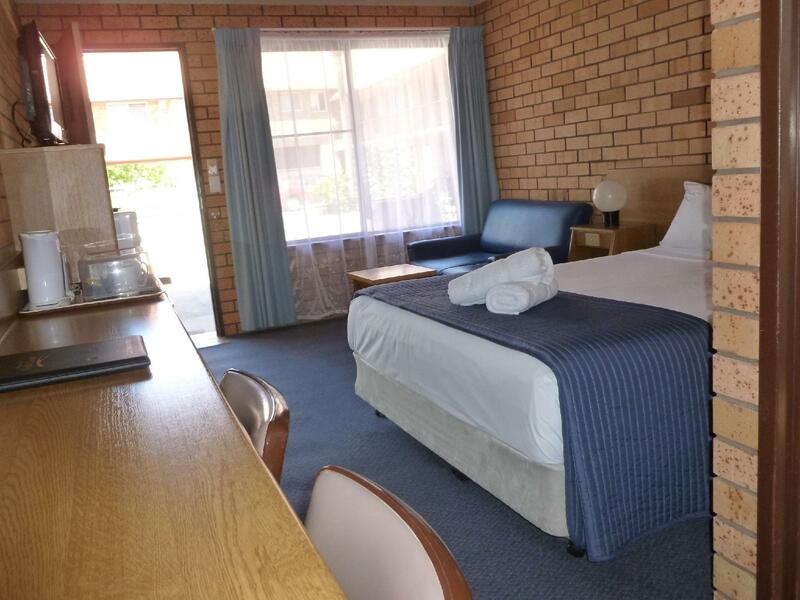 Clean spacious room, tea and coffee facilities, toiletries and hair dryer available. Also had a pool. Close to amenities and to the beach. What a little gem The Royal Palms is. 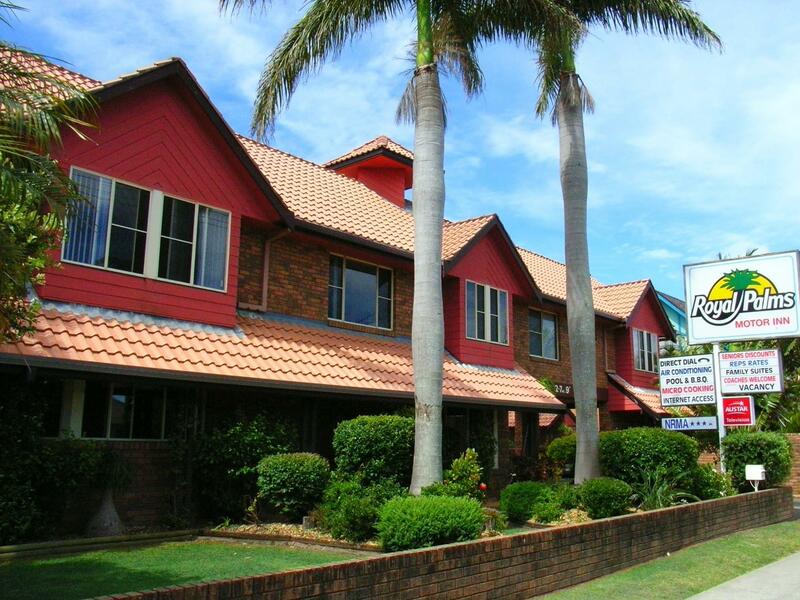 Close to the Beach and shopping centre, plenty of onsite parking, rooms are clean and large and well appointed. Not a huge tariff so I would highly recommend this motel. Easy to find with a lovely brekky joint "cafe 180" just next door. Clean. Suitable for family , friends. Good sound proofing between the rooms. Flexible check in time:) the friendly lady staff allowed us to check in at 1. Will come back again! Large rooms, clean, comfortable bed, great water pressure. BUT, paper thin walls allowed me to hear the elderly couple next door flushing the toilet all through the night, as well as their 0530 alarm, breakfast, showers, and loud conversation. Great for an overnight stop over on the way to Sydney but would definitely be happy with a longer stay. Short stroll to beach and restaurants. Room had everything you needed and most importantly the bed was comfortable. Also had the option to pre order breakfast (continental or cooked) however we arrived too late for this. As we were arriving late, we received an SMS with instructions on how to access room. Value for money was excellent! We had only an overnight stop on the way from Sydney into the Gold Coast, but wished we had an additional day or two at Coffs Harbour. This family style inn was a classic step back in time, cosy, comfortable & service with a big smile. Could have stayed for a couple of weeks easily. Basic amenities were in order but the big plus was the personalized feel of service. Lady at the front desk was kind enough to point us the way to a local attraction (Surfer's Club) where we enjoyed the Breakfast of our Life......... old school open verandah fronting the glorious beach & surf with spotting of a wild baby Kangaroo as an added attraction! A very good option to break the drive between Sydney and Brisbane/God Coast. Well presented room was comfortable and very clean with a microwave, toaster and tea/coffee making facilities. Staff were friendly and helpful. Wi-fi was serviceable for email and browsing. A short 5 minute walk to a larger shopping centre with supermarket and all major services or a shorter, 2 minute walk to a smaller shopping centre with takeaway foods and smaller supermarket. The rooms were clean and well ventilated. Parking is within the motel. Located near some shops including a bakery, pizza and cafe. As expected motel for the price. We stayed at Royal Palms Motor Inn for 2 nights this week. The room was spotlessly clean with great amenities including a toaster, microwave and free wi-fi that was so fast and reliable. It was also very quiet and the bed extremely comfortable. They obviously noticed that I had drunk wine from a water glass and even left 2 wine glasses in our room the next morning for that evening. Reception staff were very friendly and very helpful. We will definitely be back!! Booked this hotel very last minute as we didn’t want our holiday to end, but our current accommodation was fully booked. Booked here as it was one of the cheapest with the better reviews. Rightly so. Reception was lovely, room was spotless, lots of people coming and going,’very friendly atmosphere all round.